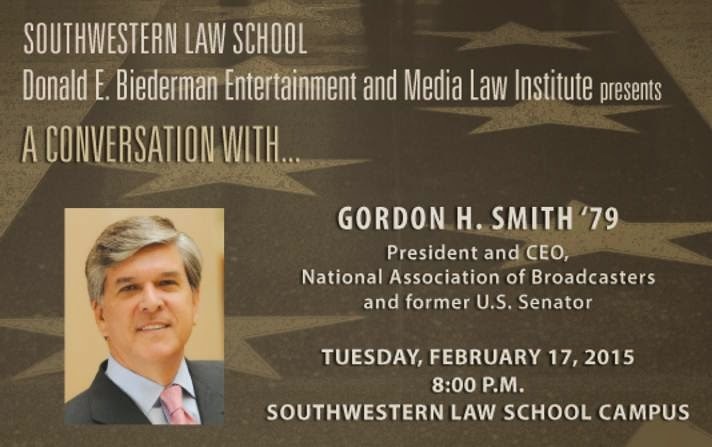 Southwestern Law School’s The Donald E. Biederman Entertainment and Media Law Institute presents A Conversation With Gordon H. Smith, President and CEO, National Association of Broadcasters on Tuesday, February 17, at 8 PM. This event will take place on the Southwestern Campus at 3050 Wilshire Blvd., Los Angeles, CA 90010. Parking on campus is $10. The free event will offer one hour of CLE credit and be held in the law school's Bullocks Wilshire Building (3050 Wilshire Boulevard, Los Angeles). Although there is no charge to attend, reservations are requested and can be made through the Institute Office. Parking is available on campus for $10. Click here for directions to campus.